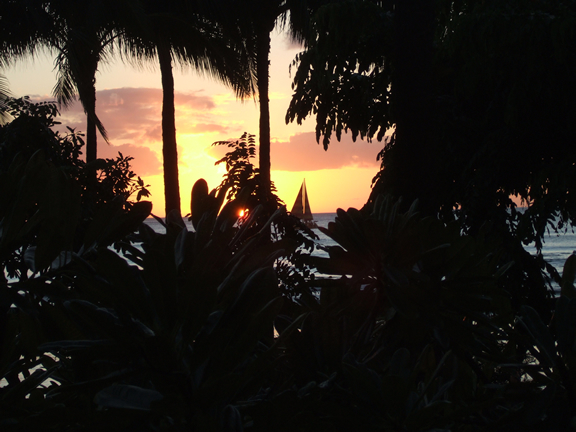 Hawaii--For those of you who have had an opportunity to spend time in this beautiful paradise, your pictures and the images you have maybe much more precious then those below. 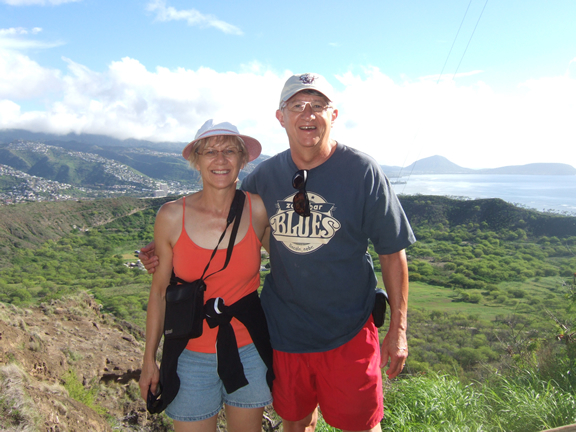 The 12 days we spent on the Island of Oahu was fantastic and filled with great memories of good times and wonderful people. 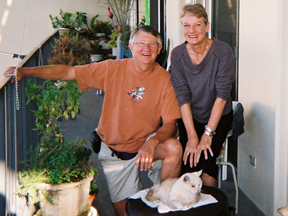 To contact us click here: Larry and Glorine. 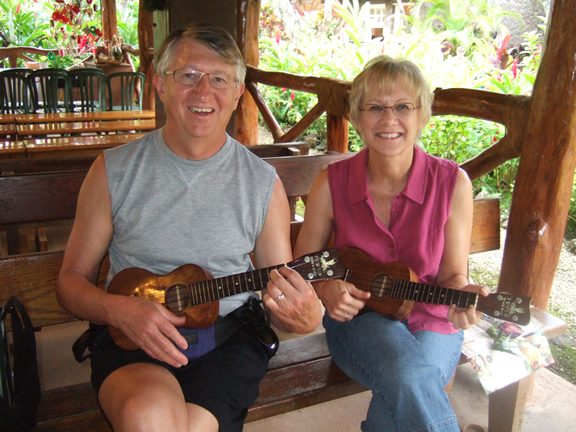 On our drive from the airport to the North Shore, our first stop was at one of the largest pineapple farm in the world--the Dole Plantation. 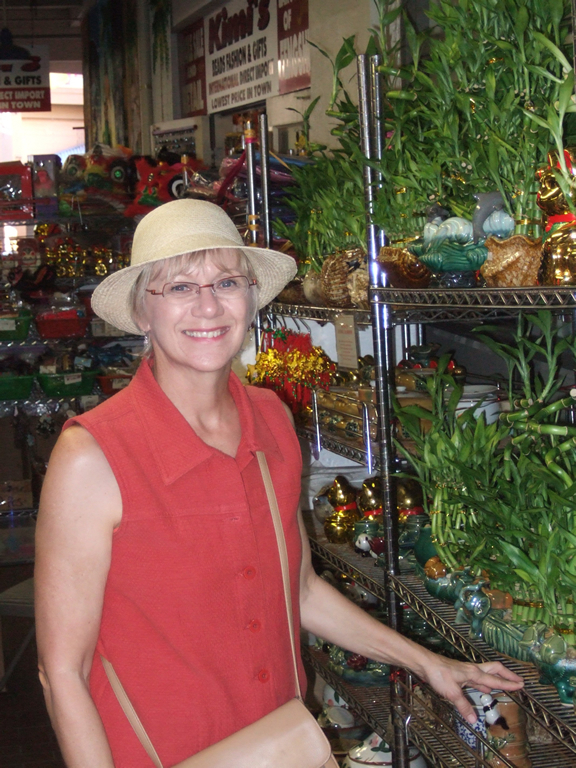 We toured it by train and walked and saw the various stages of production. It is the first time Larry truly enjoyed eating a pineapple. 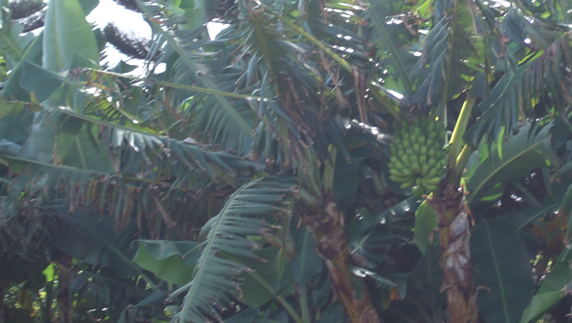 They grow other crops such as bananas, coffee and other assorted tropical fruits. Click to enlarge all small pictures. 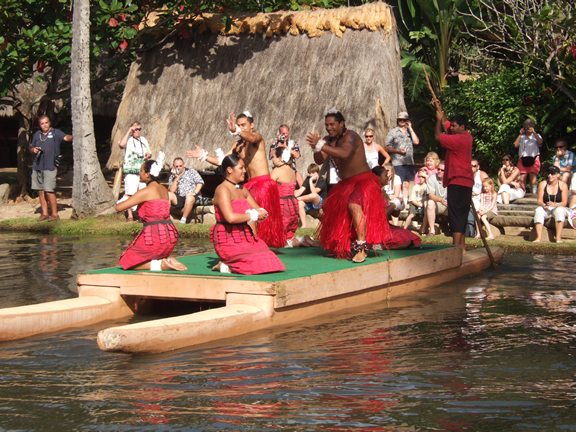 One of the popular attractions of this Island is the Polynesian Cultural Center located on the North Shore. 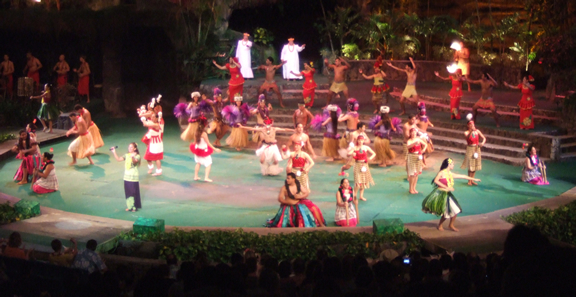 It is 42 acres dedicated to cultural awareness of the "indigenes" people of the Pacific Islands, including Hawaii, Samoa, Aotearoa (New Zealand), Fiji, Marquesas, Tahiti, and Tonga. We were so impressed with the Center, we went back a second day. They conducted demonstrations of early skills, arts and crafts, which we participated in. 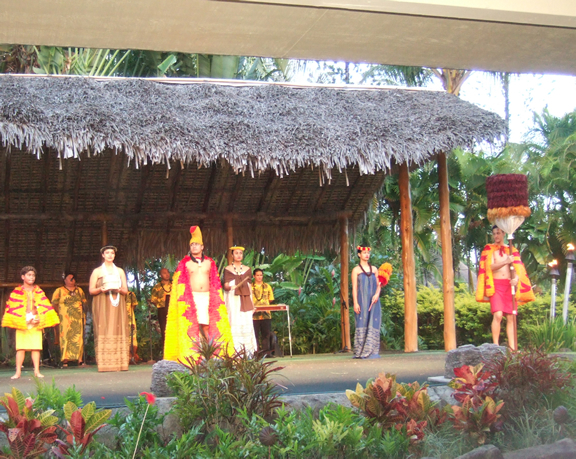 They also had an authentic Hawaiian luau followed by an evening show of dancing and music from the various Islands. 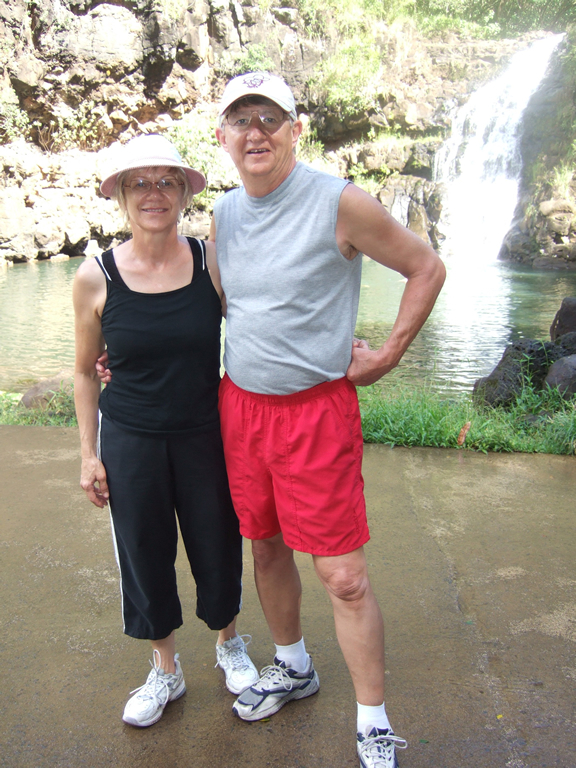 Waimea Falls was another truly unexpected pleasure. What started off as a 30 minute walk to a water fall turned out to be an all day adventure. 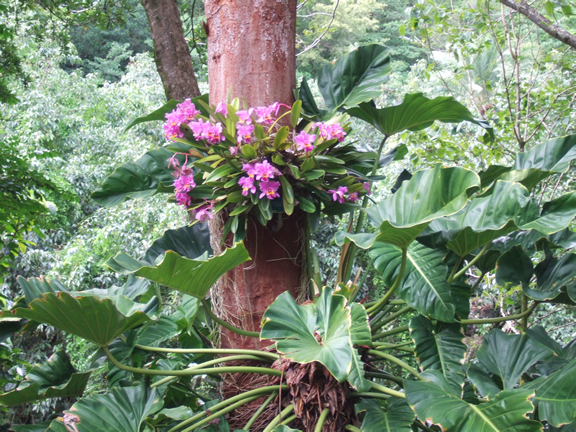 In addition to taking a dip in the pool of water by the water fall, we spent hours looking at the lush vegetation, flowers and the other plants unique to the tropics from around the world. It is operated by the Audubon Society. 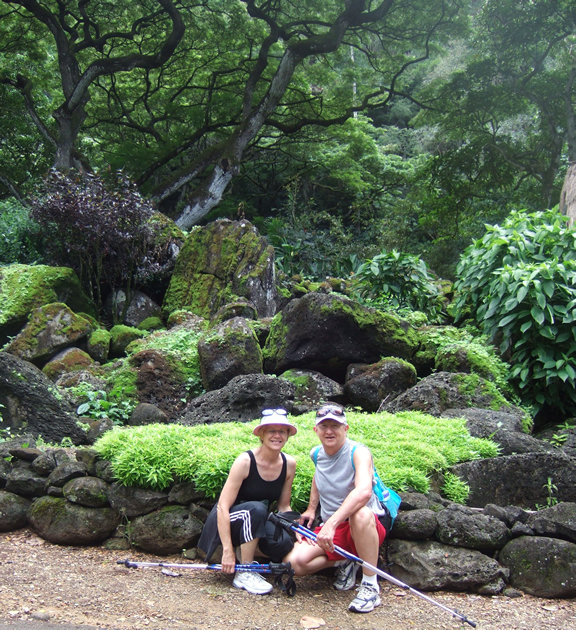 Pa'U O Mahufa Heiana is in ruins, but stands as a remnant of a major temple on the North Shore, near Waimea Falls. 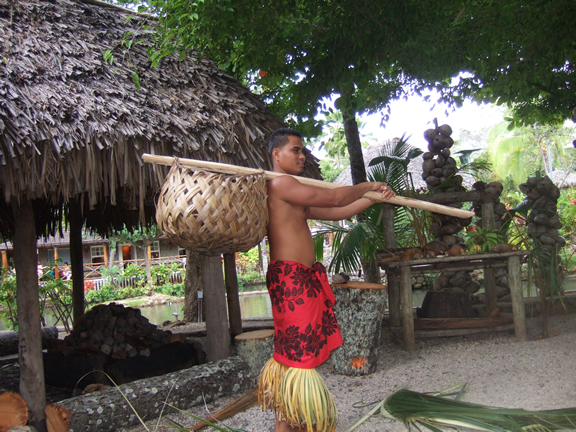 It was used for spiritual ceremonies for the Kings and other high dignitaries that date back 250 years. It was abolished by the Catholic Church in 1819. 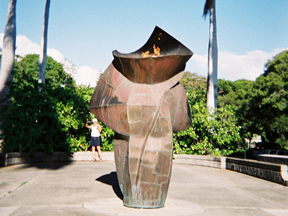 It still symbolizes the spiritual values of the native Hawaiians. 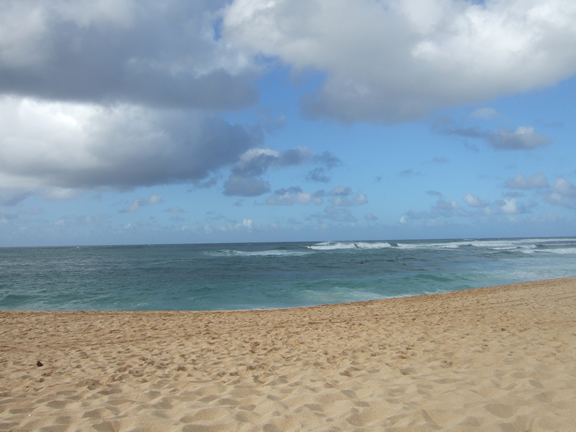 Sunset Beach and the famous "pipeline" lie along these shores. 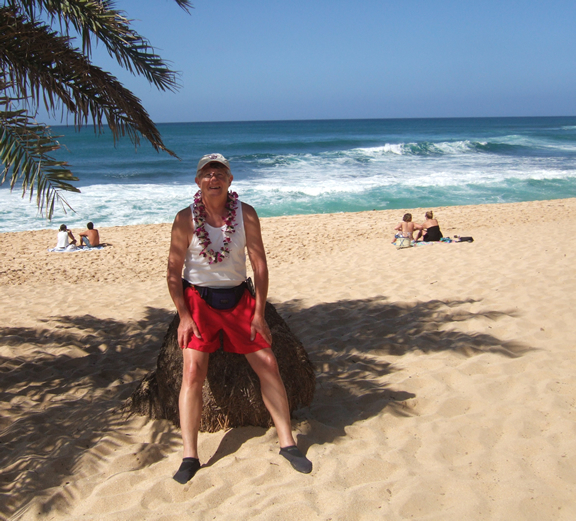 We walked along the shore every morning and took time to soak up the sun and watch the surfers get ready for a big surfing contest the following week. The beaches were fabulous. 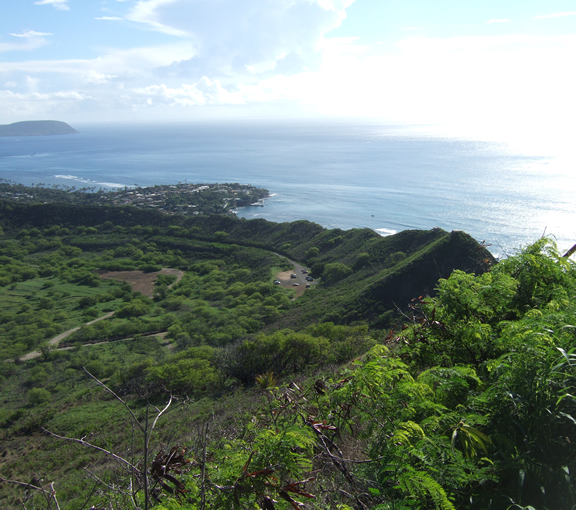 The Punch Bowl is a former volcanic crater that is home to the National Cemetery of the Pacific. 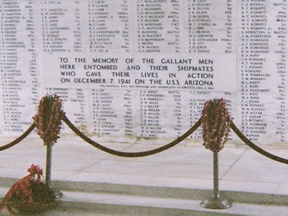 It is dedicated to the many fallen men and women who lost their life in the Pacific Operation during WWII. 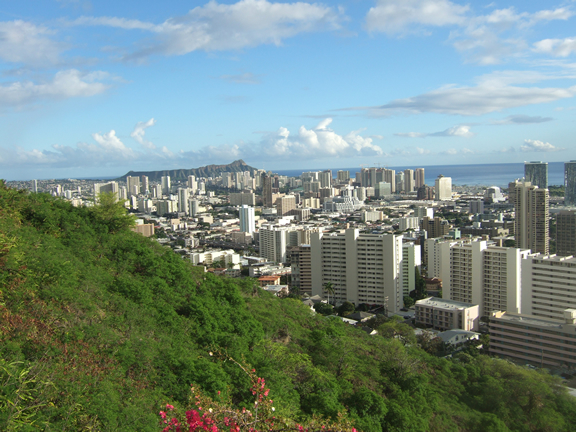 This area is not very well noted on the tourist maps, but is worth the time to see the cemetery and the fantastic view over the city of Honolulu. 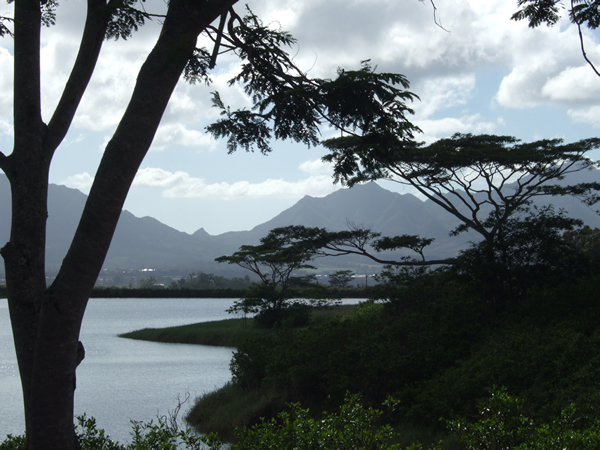 The west side of the Island is a contrast of vast proportions. 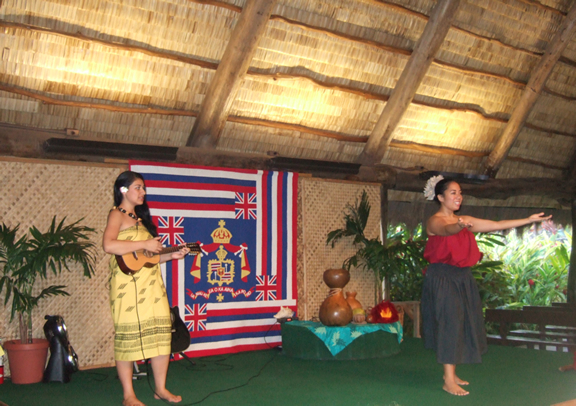 While the ocean and mountains were splendid to look at, they included the "forgotten half" of the Hawaiian populations. 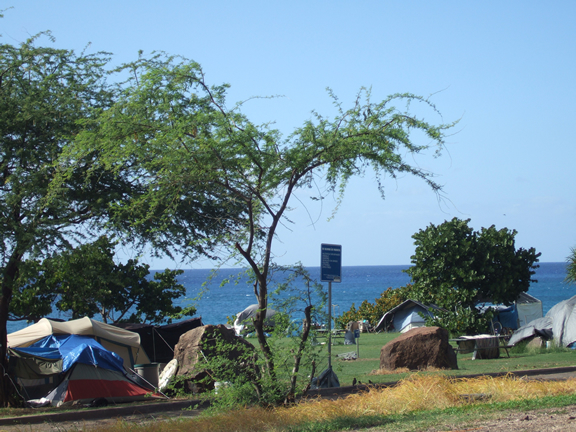 What looked like tenters enjoying the weekend turned out to be permanent make shift housing for the homeless. It was a little freaky. 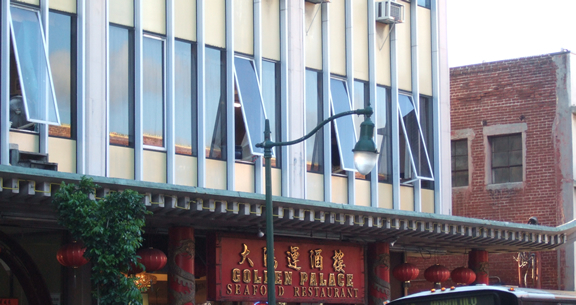 Every large city has its "China Town" and so does Honolulu. 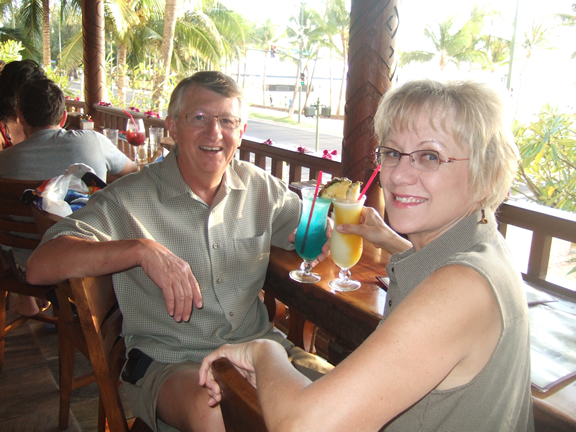 We spent a few hours taking in the local culture, which included lots of trinkets, seafood and a trip to a bar or two. 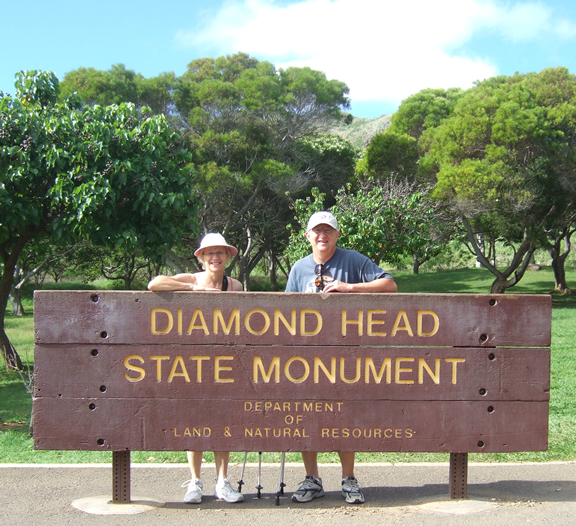 Diamond Head is a "must see" sight. It is a large volcanic crater, but unlike the PunchBowl, it has been left in tack with the rustic beauty of the inner and outer rim uninterrupted. 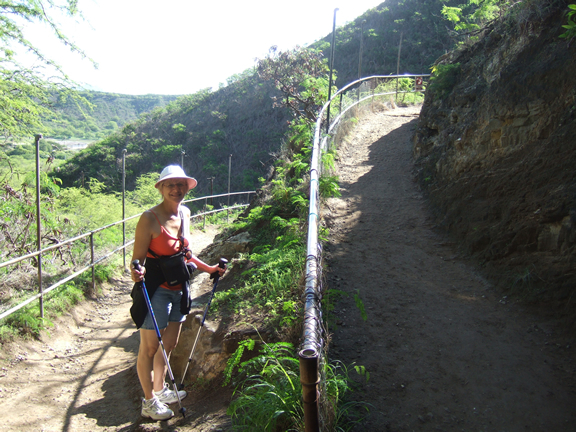 Sightseeing in Hawaii is easy. Around every curve on the road was something new and unexpected. 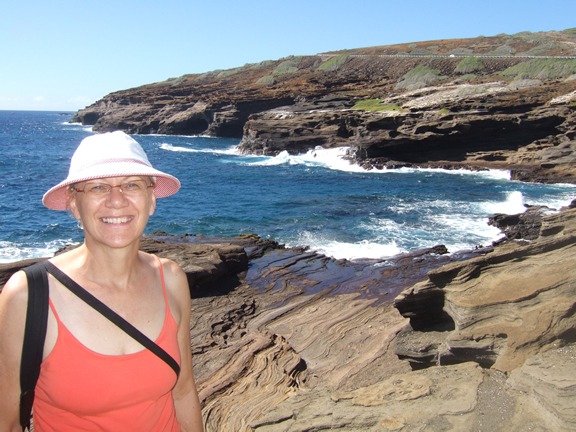 We spent one day driving along the southeast and east coastline and were taken in by the breath taking views. 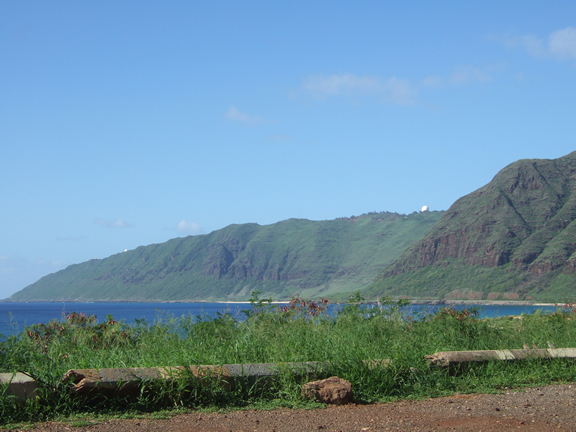 It took forever because we stopped every few miles to take pictures of the splendor that makes up Hawaii. 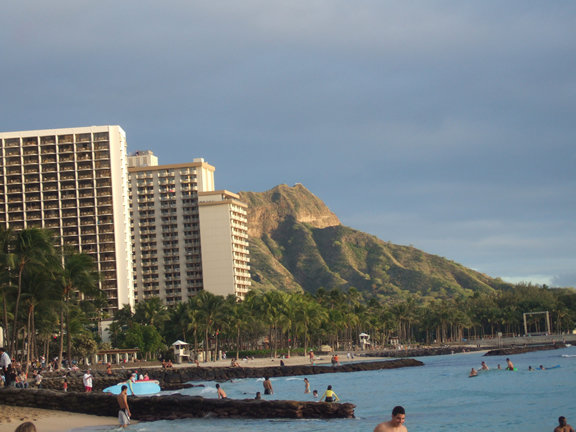 Waikiki Beach is one of the most frequented tourist spots in Honolulu. 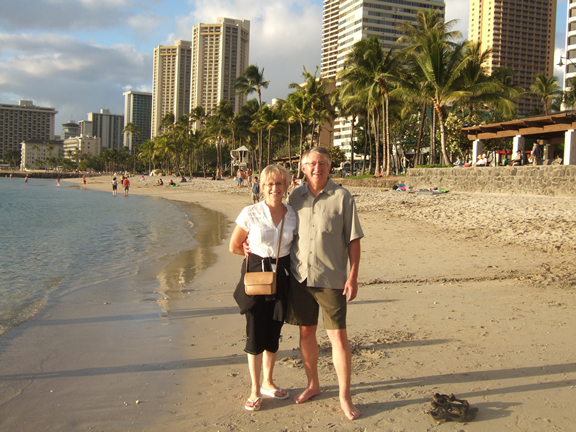 We spent Thanksgiving there enjoying the perfect sand beach, the skyscrapers, and a wonderful Thanksgiving meal at LuLu's, a great local restaurant with the best view in the house. 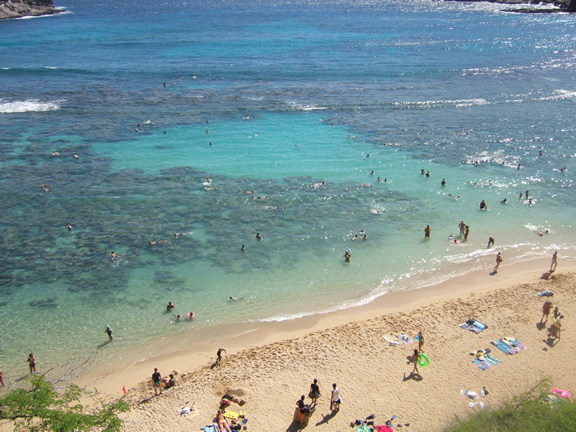 You can't go to Hawaii without taking in the beautiful bays filled with tropical fish and great corral. 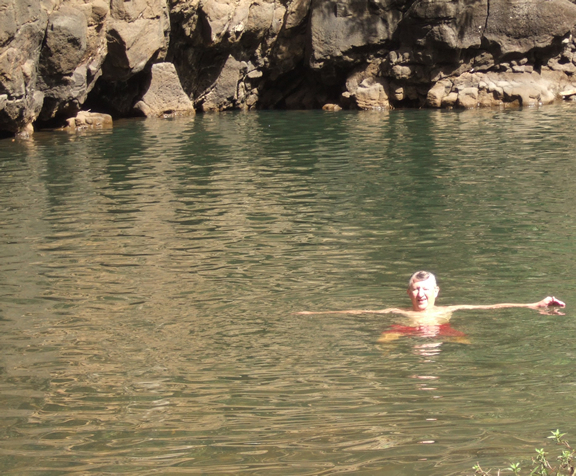 We did not have an underwater camera, so you have to take our word for it--it was splendid. 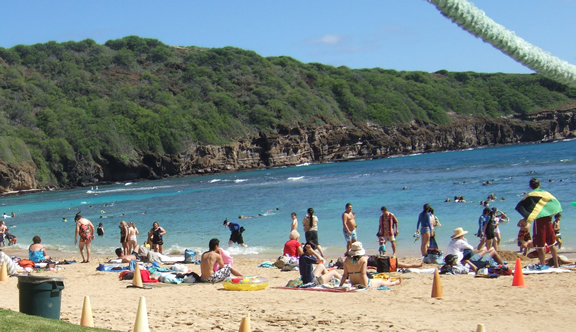 The single event that got us thinking about Hawaii in November was the Western Athletic Conference championship game between Hawaii and Boise State. 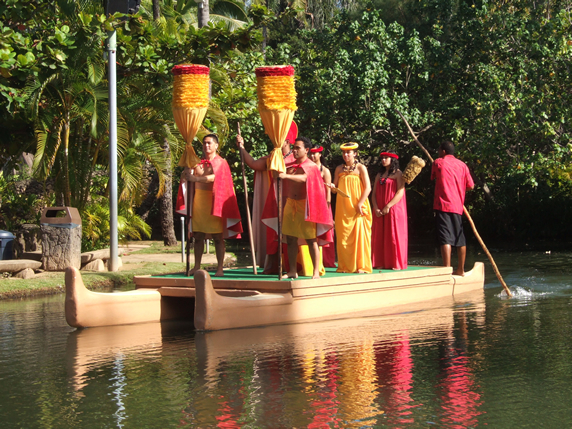 Hawaii won (convincingly) enough said. However, the pregame was unbelievable. 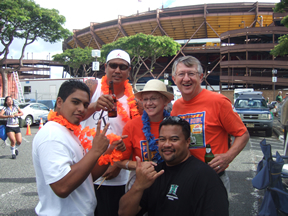 We were taken in by a group of Hawaii fans, who treated us like family. What a treat!! 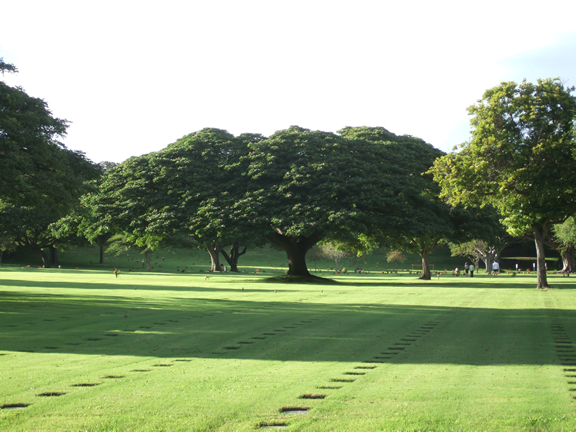 One thing Honolulu is noted for is "lots" of memorials to those who lost there lives in war. The little guy in the background was Larry who found a Geocache, where we left a Boise State key chain and tracking tag. We just received an email that it has been found and dropped off at another site. 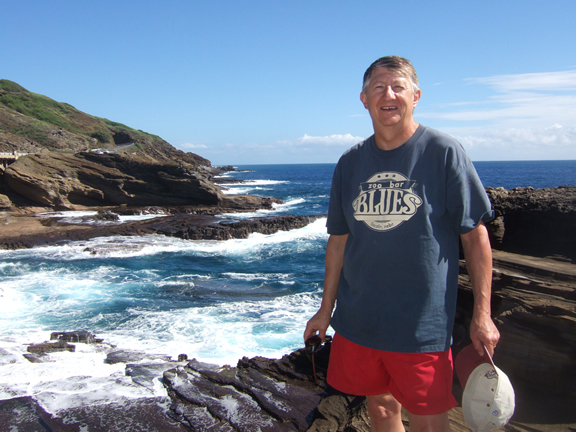 Honolulu has thousands of Geocache sites, for those who are interested in doing some treasure hunting. 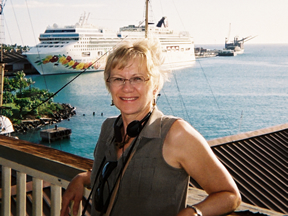 The most noted harbor in Honolulu is Pearl Harbor, but is one of dozens of sea ports. Luxury liners to cargo carriers come and go every day. 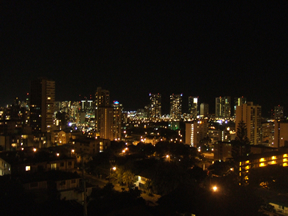 This picture was taken near pier 10, which is one of the closest to Waikiki Beach. 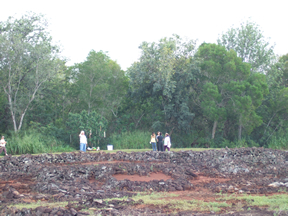 It will soon be expanded with a super ferry to take tourists and freight to the other islands of Hawaii. 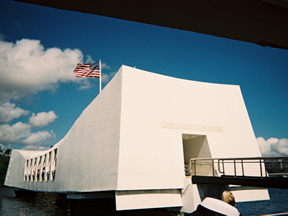 December 7, 1941 will live on as one of the most tragic days of the 20th century. Hundreds of Japanese fighter pilots took out the entire American fleet in a few short hours. One of the dozens of ship that was sunk was the Arizona, which still entombs many of the seamen that were on board that fateful morning. It was a somber moment as we toured the memorial. 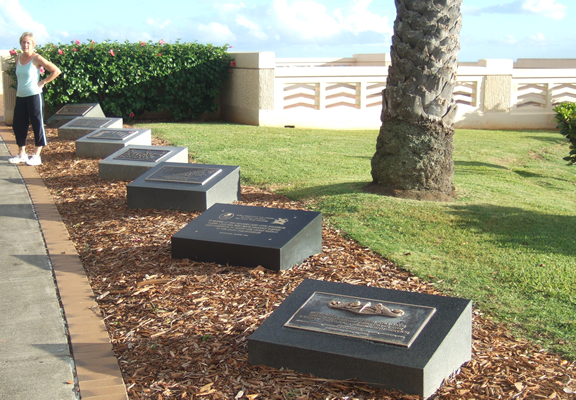 Inscribed in marble were the names of nearly 3,000 people who died during the Pearl Harbor attack. In addition to soldiers there were hundreds of civilans, including a three year old girl. The whole tour was an emotional experience. 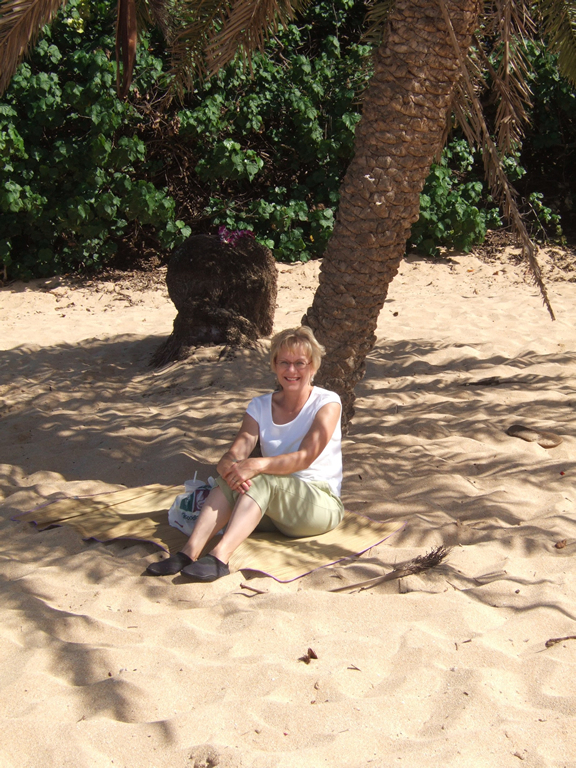 Arrived in Hawaii on Thursday, November 15 and left for California on Monday, November 26, 2007.